Every since the VTech Toot Toot Drivers range was introduced a couple of years ago it has proved to be a huge hit with pre-school children, boys and girls alike. The range started off with a garage and range of little vehicles to go with it. Since then it's been expanded to also include extra road pieces, a fire station, a car transporter and most recently an airport. The unique thing about the Toot Toot range is that each of the vehicles plays its own little tune, singing about what it does. This can mean that if you have several vehicles and have them all switched on at one you can end up with quite a cacophony of noise. It's not a mistake you make often! On a one by one basis though it is a really nice touch and one which children seem to love. VTech have also made the cars to be a perfect size to fit in a little hands and they don't have any fiddly bits to cause problems for really young children. The build quality is high enough to withstand a toddler throwing them across the room whilst having a tantrum - and our little reviewer seemed very keen to test this particular feature exhaustively. The VTech Drivers Toot Toot Airport contains a control tower, refuelling point, a weather vane, lift up barrier and several road pieces, and it also comes with an aeroplane. Attached to the control tower is a "cloud" platform which you can sit the aeroplane on and when you turn the antenna on the control tower this makes the cloud travel around the tower, making the aeroplane fly. The cloud platform may sound like a bit of a silly feature when it's described here, but all the children I've seen play with the airport seem to find it their favourite part. Also just running round the room with the aeroplane itself also seems to be incredibly popular. The airport also contains six SmartPoint "sensors" which make the aeroplane play certain phrases and sounds when it passes over them. These aren't really "sensors" in the true meaning of the word as what they actually do is cause a combination of small buttons on the underside of the aeroplane to be depressed as it passes over it. Depending on what combination is triggered determines the message played. 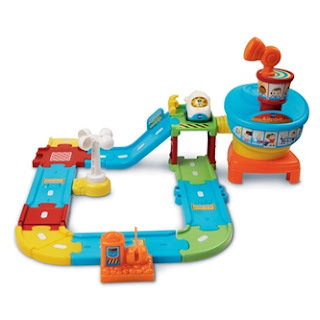 With the track that comes with it you can physically connect the Airport to other pieces of the Toot Toot Drivers range. The slight complication comes with the SmartPoint technology which was only introduced to the Toot Toot Drivers more recently. If you have non-SmartPoint vehicles then they will obviously not be triggered by these sensors. There is more of a problem though which is that the original non-SmartPoint vehicles are actually a couple of mm wider than the newer SmartPoint vehicles. This means that the older vehicles physically do not fit over the SmartPoint sensors in the track - causing a degree of frustration to little hands trying to push them round the track. The newer SmartPoint vehicles work without any problems on the old track, but if your children already have older vehicles it's something to be aware of if you plan to buy them part of the Toot Toot range that includes SmartPoint. All new Toot Toot Drivers range elements now feature SmartPoint, but be aware that some retailers may still hold non-SmartPoint stock and not yet realise incompatibility problems. The Toot Toot Drivers Airport is perfect for any pre-schooler who loves vehicles and aeroplanes in particular and provides it an excellent starting point for hours and hours of imaginative role play. The suggested age range for the Toot Toot Drivers range is 1 - 5 years and they really do work very well for children as young as one, making them ideal as a first birthday present. The VTech Toot Toot Drivers range is available in all three Cuthberts stores (St Albans, Letchworth and Hatfield Galleria) as well as from our online store. Ben (2 1/4) has the garage, the fire station, the traffic lights, the airport and numerous cars. All bought from his favourite toy store. When they're all on at once it is noisy, but he loves playing with them all. Recommended.